We use Sonlight in our homeschool. Their educational approach to learning through books is a good fit for our family in this season. Something that I love about their books is that it’s not just the children who enjoy them, I do too! 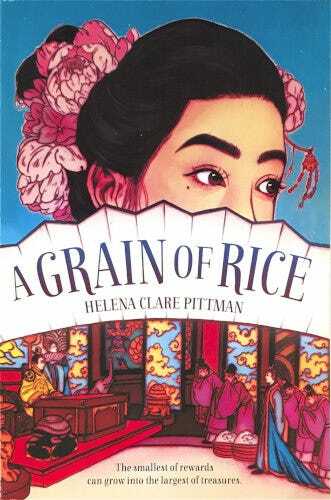 I would definitely add A Grain of Rice by Helena Clare Pittman to the list of books I enjoyed. I’d never read it before nor even heard of it. A humble farmer wants to marry the Emperor’s daughter . . . and succeeds because of his wisdom. It’s a short book; we started it yesterday and finished it today. It was a simple tale, with a happy ending but what really got me excited was all of the easily captured ‘teachable moments’ . I will readily admit to you that I am am sure I miss many teachable moments in the day. I do have friends, both online and in real life, who see teachable moments in almost everything and I am in awe of the way that they can impart wisdom, direction and an awe of God into everything. Don’t get me wrong, I try; but some people are just more gifted in that area I think. While the book isn’t a “Christian” book, it was very easy to talk (and see evidence!) of how Pong Lo’s outward actions and attitudes were a reflection of his heart’s attitude and how it affected others around him. From there is was a simple shift to talk about our hearts, actions, attitudes and letting other’s see Christ in us. But my favorite part is how Pong Lo was a lowly farmer’s son who was given a lowly opportunity (scrubbing storehouse floors and shelves) and how he did his very best faithfully (and with a happy heart!) and was promoted little by little. It was the perfect time to talk about faithfulness and responsibly; both to the Lord but also in practical every day living. Like being faithful to go straight to the mailbox and straight back, when you are faithful in the little things, mommy can then give you more responsibility and freedom. So just a short little book, a simple yet engaging tale with no scriptural references and yet so much to offer. I just wanted to share this little treasure with you today! I definitely can see our family reading this book again. PS. You can purchase A Grain of Rice here for $4.84 today with free shipping. Whenever you purchase through Beautiful Calling (through a post like this or through the ads on the side), you support this site; so thank you! This post is under “Books, Homeschooling, Teaching Tots” and has no comments so far.